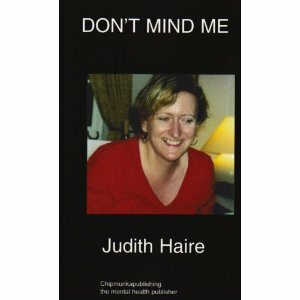 Judith Haire’s memoir, Don’t Mind Me, spoke to me from the very start. A title like that says so much. It’s a theme that clearly helped her survive earlier times. Don’t Mind Me was the first account I’d read about the experience of a psychotic break. Who isn’t curious about psychotic breaks. The memoir didn’t disappoint in the details of what it felt like and what happened, so we could come to our own conclusions. Judith wrote that her psychotic breaks were the result of prolonged abuse and trauma. Reading her story, that makes sense. What soft-skinned sensitive machine could tolerate neglect and abuse without stopping functioning? Why would we expect humans to tolerate more? Don’t Mind Me is a very good story about emotional neglect, and striving for accomplishment; emotional abuse and domestic violence in relationships; psychological breakdowns, followed by healing; more struggles and more healing, as the author rebuilds a good life. It is also an important story, because there are all too few first person accounts of psychotic breaks. Books with an important story need to be read, whether or not they are perfectly presented. As a micropublisher, and editor of an online writers magazine, I know, by the standards of the book industry – no blemishes, no imperfections – that this book would be stronger with another round of edits and a bigger designer budget. If you are someone who requires a perfectly edited and formatted book then pass on this one. But, keep in mind: book perfection is bought with big budgets. Many do not have the economic resources to polish a book to perfection. There are millions of stories that humanity can and needs learn from, from writers who don’t have the resources, and from publishers who are stretching to make the book happen. Millions of valuable, life-informing stories. I found Judith Hare’s, Don’t Mind Me, compelling reading. I literally turned page after page wanting to know what would happen. Even though the editor in my mind was taking note of edits at first – a malady editors that have – it wasn’t long before I was engrossed in Judith’s life. Judith Haire is well educated and intelligent. She has contributed to the understanding of mental health with her memoir and essays. Hers is a voice worth listening to, even if you respond to the topic of mental illness with fear and aversion. I am grateful to Judith for writing her story. Don’t Mind Me left me feeling uplifted, with a deep appreciation for Judith Haire’s courage and spirit. Have you ever thought about writing an ebook or guest authoring on other blogs? I have a blog centered on the same topics you discuss and would really like to have you share some stories/information. I know my visitors would enjoy your work. If you are even remotely interested, feel free to shoot me an e mail.